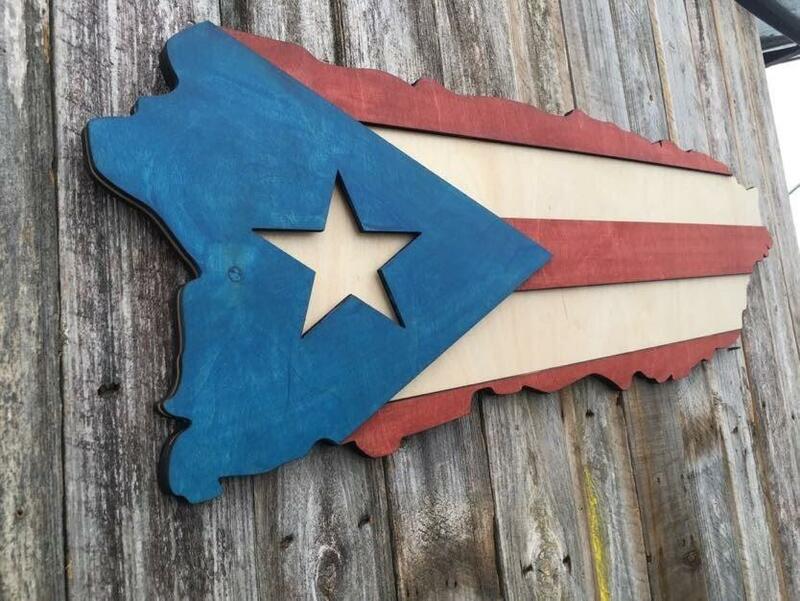 I was asked to make a large Puerto Rican flag as a secret birthday present that would have to go outdoors (although that might not be true anymore). The coolest one I could find was this one with the outline of the island. Since straight lines on the flags is a very common thing - I decided it needs something some wave. It was a bit tedious to make the wave right - the flags are normally 3x5 feet, but the island shape is flatter and longer (more like 3x6.5 in my case). I just ended up stretching some stuff a bit and kept the star shape regular to not look odd. Fired up the projector and got going. Pressure treated exterior plywood was used since the original plan was for the piece to be hung outdoors. The outer shape all cut out. I cut everything into separate pieces to make it easier to paint as well as create nice lines. The star was cut out as well. Mocking up after the paint before putting the backing boards on to hold everything in place. Starting the dry brush process - adding a little weathering. It always shows more in person so it's something to go easy on. My original plan was to have an insert for a star, but it ended up not looking right and I scrapped the idea. Instead I just made a backer board and painted it white. Turned out much better. Sprayed it with several layers of clear coat on my medieval chic painting rack to withstand the elements, however the birthday girl loved it so much that it will unlikely see the elements and will hang under a covered porch or overhang instead. All dry and finished. Awesome looking and fun piece to make!